How important is a First Aid Kit for your Survival? 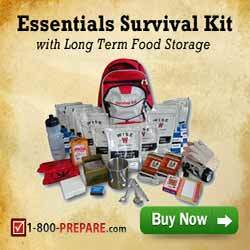 Have you ever asked yourself on how well you would survive an Emergency or Natural Disaster? It may be a major earthquake to a being caught in a hurricane to a virus outbreak to a tsunami to a bush fire to a snow blizzard while travelling home from work. There are so many potential natural disasters! Did you know that in 2014 there were over 400 major natural disasters that impact more than 100,000 people with each incident? The estimated number of people that have been impacted globally by disasters each year is estimated to be over 220 million people (Red Cross (IFRC) World Disasters Report). There is a growing trend in the number of natural disasters in the last 3 decades. It is growing at an alarming rate of over 5% per year. So why not prepare yourself? The simplicity, cost and effort of preparing for a natural disaster or personal emergency can be so minimal. It would be personally and emotionally devastating if you could have prevented the enormity of the level of disaster or emergency and the consequential long -term damage. This certainly screams out loud for every person to have a medical first aid kit handy. Preparing yourself can prevent at worst, death, loss of all personal belongings from things like a fire. Unfortunately, I personally didn’t realise this until it was too late. It has taken my family many years to recover. I could have significantly reduced the impact of what happened if I was a little more diligent. And it didn’t need much effort. I have prepared a simple FREE First Aid checklist for you. It outlines the very minimal basic areas you should do in preparing for such an event. Take 5 minutes to read this potentially a life saving First Aid checklist. Just fill in the form on the right side of this article to receive your FirstAid checklist. A few basic actions taken by you can to make a significant life-saving difference. Should you be involved in a disaster or emergency, the most fundamental and important reaction is ensure everyone physical safety and ensure that any injuries be immediately addressed to, if not completely relieved to at least be temporarily protected until professional medics can attend to the injury. This immediate first aid action could avoid long-term injuries or even death. Yes, everyone needs a First Aid Kit available. It could make a difference. The single most important item that I believe should be compulsory and I highly recommend is to have at hand is a basic First Aid Survival Kit. This will address most injuries. It certainly can stop making the injury worse. It can help stabilised the injury and increase the chances of survival for a few more of days. In most cases, only common sense is required to apply first aid. Ideally, first aid training would be useful. There is no reason not to have a basic First Aid Kit handy at home, a comprehensive portable first aid kit at work, portable first aid kit in your car, sports club, church, backpack and campervan. They relatively inexpensive and don’t take much space. They can last for a number of years without being replaced. The life-saving first aid survival kit really could make a difference! I use 1-800-Prepare to purchase my families first aid kits and emergency supplies. Don’t wait, it will only take a couple of minutes to purchase one for home and your car. One thing I have learnt, as a Scout would say, ‘Be Prepared’. You do need to prepare yourself for an emergency or natural disaster. Statistics shows that you will be likely to be caught up in one. Depending on the scale and enormity of the event, you may not get support in a timely manner from local emergency services, local and federal governments or other agencies due to them being overwhelmed and more than likely under-resourced. I am sure you have heard of endless examples of this over the last few years. That fact is, in a major disaster it is impossible for any agency to help everyone. There is a good article in plain clear concise everyday language on Emergency Supply Kits that makes it easy to understand what should be considered. Being prepared for a disaster is heavily influenced where you live. For example, if you live in the centre of the USA, you are not going to be hit by a tsunami and if you live in Hawaii you are more likely to be hit by a tsunami or volcanic eruption not going to be hit by a snow blizzard. We have a growing body of knowledge on how to survive a disaster. . This knowledge has been gained from assessing and reviewing actions, strategies and plans in past disaster events. Some of the major lessons learnt and improving natural disaster strategies come from reviewing past major events. The article 10 natural disasters and the survival preparedness lessons provide some learning from these events. Emergency workers, Disaster Prevention Specialists, FEMA and other agencies have categorically agree that being prepared and being ready to respond is paramount to survival. Don’t expect someone come to your rescue in a major disaster. When they do come, consider it as a welcomed extra. There is some great survival information that you should really need to be aware to help you understand the gravity of what I am trying to say. In the video, there is some startling facts revealed. Take some time to watch and listen to this short video. CAN YOUR AFFORD NOT TOO!